This is a video/blog post that I should have done a long time ago, but instead I waited for the lovely Sanni from MissMai27 on YouTube to tag me in a tag that she created, aptly entitled, “My Top 15 MAC Eyeshadows”. The task seemed simple enough, but once I pulled out my palettes and starting looking at all the pretty colors, it was hard to decide. Do I pick the 15 colors that I think would make a great first palette for someone, one that covers all the different shades/colors/textures? Do I pick the 15 prettiest shades? In the end, I picked the 15 that get the most use in my daily life. They’re all rather similar, for the most part, but I’m a creature of habit and I like what I like. Below is the list of my top fifteen shades, and a brief description of each of them. If you click on the name of the shadow, you will be whisked away to the Nordstrom website, where you can choose to purchase them if you would like. * There are swatches at the end of the post, and if you want to see (and hear) more of me, please watch the video at the end as well. Nylon-This is the ultimate inner corner highlight, or if you’re really looking to brighten up your eyelids, you can use this all over the lid. It’s described as pale gold with an icy shimmer and it’s a frost shade. I’d recommend using a fluffy brush to put this on, because if you pack it on and you then go outside, you will blind any pilot flying a 737 at 37,000 feet. Blanc Type-this is a matte, creamy beige shade and very opaque. 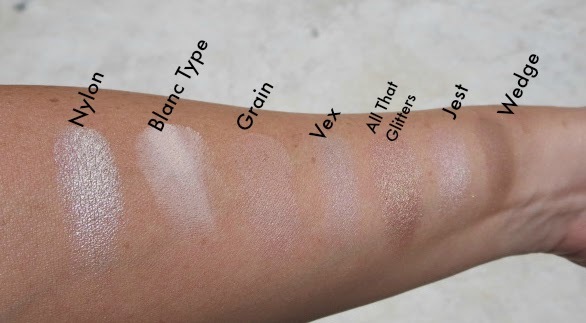 It’s the perfect brow bone highlight shade for pale ladies like myself. Grain-This is a satin finish shadow, which is my all time favorite kind of finish. It gives a nice gleam to the skin without the crazy glitter fallout that is just not attractive on anyone. Grain is described as a golden beige with an icy shimmer. It is a beautiful shade to wear all over the lid for a very soft daytime look. Vex-I first learned about the awesome-ness that is Vex from watching a Pixiwoo video. I generally shy away from cool-toned shadows but I just had to have it. It has a duo chrome quality that I just think is…well, cool! It lays down as beige but has pink and green shimmer in it, depending on the light. This is another great shade for all over the lid, the inner corner, or even to blend out the crease if you want a neat night-time kind of eye. All That Glitters-This shadow has a Veluxe Pearl finish (this is according to MAC, but I have no idea what that means). It has a beige, sort of gold tone to hit with hints of pink, at least on my skin. It is definitely my all time used lid shade. It’s beautiful. Jest-Although pinks can definitely be tricky to pull off (it brings to mind diseased, runny eyes), this one looks lovely on the lid, blended out with a soft brown in the crease. Jest instantly brightens my eyes and gives a nice warmth to the skin. If you’re afraid of pink, give this shade a go. Wedge-This is not an exciting color, but it’s a must have, staple kind of shadow that should be in everyone’s collection. It’s not too dark, it’s not too light, and it’s the perfect matte crease shade on which to build any kind of neutral eye. Get it. Quarry-If I hadn’t seen Sharon Farrell use this in a ton of tutorials, I would have never picked up this shade. I am so glad that I did! Quarry comes out to play a lot in the fall and winter. It’s a matte shade, with a plummy brown tone to it. 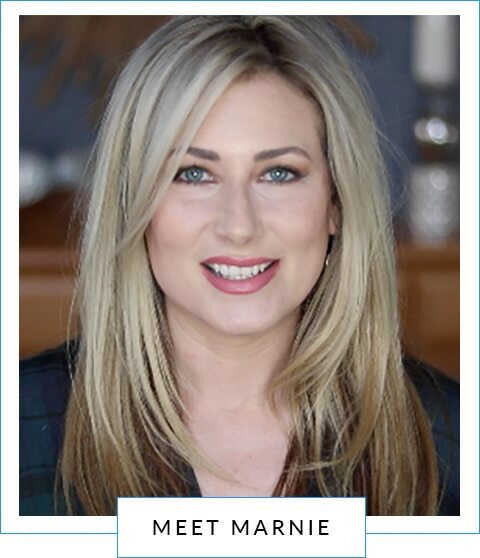 If you want to add some color to your neutral eye but don’t know where to start, try using Quarry in the crease. It’s subtle, but it’s a great start. Haux-For the record, according to many internet sources (and aren’t those reliable), the correct pronunciation of Haux is the same as Hawks. Hmm….regardless of how to pronounce it, this is another great satin shade that is useful to use as a crease/socket color, or to blend out a smoky eye. It is described on the MAC website as a soft, muted rosy brown. Omega-This shade is the workhorse of the bunch. It works well to fill in brows from light to medium shades, excellent for contouring the fairer skinned faces, and a fabulous but much overlooked crease/socket shade. It is a cool-toned, soft, muted beige taupe. Woodwinked-When I got Woodwinked, I was slightly terrified of it. It seemed so bright and shiny in the pan, and I was sure it would look ridiculous on my eyes. Boy was I wrong! I get compliments every time I wear this shade. It happens to also have the biggest dent in it out of all my MAC shades. It’s a Veluxe Pearl shade, and it’s described as a warm, antique gold. If you have blue or green eyes, this will make them P-O-P! Sable-One of my first MAC purchases, Sable is just one of those easy to reach for shades. It’s a velvet finish, with gold, plum, and bronze-pearl shades. Doesn’t that just sound like something you want to sweep across your lids? I use it a lot in the outer corner, but it’s also great to wash across the eye and through the socket line. She’s a pretty one! Mulch-This is a recent addition to my collection, and I blame it all on those of you who comment on my videos. You said I needed to have it, so I got it, and you were right. If you love a bronzy, red-brown velvet finish, and frankly, that’s my favorite kind, then you need this in your life. It looks great on all skin tones, and the red in the shade brings out green eyes beautifully. Sketch-Shockingly, this is another reddish undertoned shade. I know what I like, and I generally stick with it. Sketch is the newest out of the 15 to my collection, but I’m so glad I picked it up. I wear it constantly in the fall and winter. It pairs well with all those smoky plums and browns, and looks gorgeous on green-eyed girls. It’s a deep shade, but with a light hand and a fluffy brush, it is very user-friendly. So there you have it, my top 15 MAC eyeshadows. These are by no means my ONLY shadows, just the most used of the bunch. If you’d like to see these live, please watch the video below. 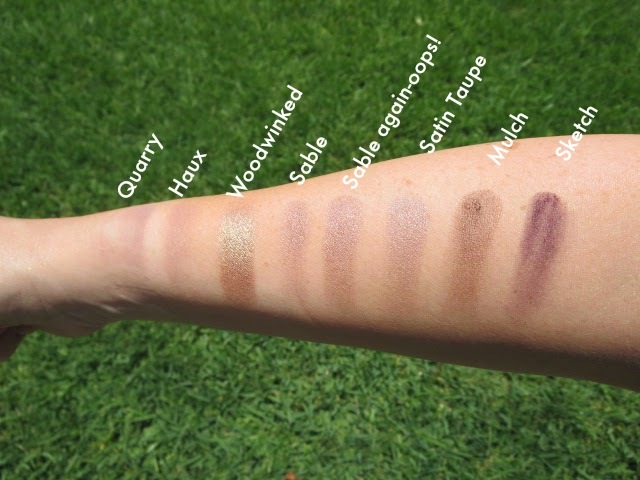 I’ve also decided to act like a “real” blogger and include the obligatory arm swatches, all labelled for your convenience. *These are affiliate links. For more of an explanation as to what those are and what I do, click here. I'm fairly new into the "MAC world"! I think I'll grab Vex and Jest!! Thanks for these recommandations! You're welcome! Let me know how you like them!